VE Test Session, Sitka, Alaska. Pick the date below. Amateur Radio Tests administered by Anchorage ARC VEC. 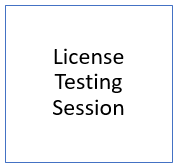 Valid for the test session indicated only. IMPORTANT: You MUST present a copy of your receipt to the Volunteer Examiners at the test session. No refunds. Notes: No exams if the date falls directly on a major holiday, such as July 4th, Christmas day, Labor Day, Thanksgiving day, January 1, etc.